David’s newest recording, “BOOM!” is currently available from Posi-tone Records. It’s his third for Posi-tone and marks a return to the traditional jazz quintet structure, featuring Josh Evans-trumpet, Theo Hill-piano, Alex Claffy-bass, Kush Abadey-drums, and Gibson’s sonorous trombone. This fiery collection of musicians breathes life into eight new compositions in addition to newly minted arrangements of Tom McIntosh’s “The Cup Bearers” and Eric Clapton’s “Change the World”. This iteration of Gibson’s ensemble continues down the eclectic path he’s been traversing for years and at times throughout, their new recording evokes modern post-bop, electric Miles and the piquant taste of the present day. There’s something for everyone contained in this musical album. Gibson’s early experience in New York had him performing with Slide Hampton, Jon Faddis, Roy Hargrove, Jimmy Heath, James Moody and others. 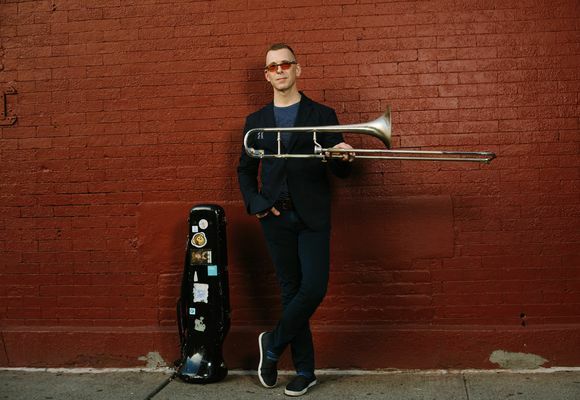 In 2003, he was a finalist in the Thelonius Monk International Trombone Competition and has subsequently released six recordings, as a leader. His current quintet has been cutting their teeth in the jazz clubs of NYC, such as Smalls, Fat Cat and Dizzy’s Club, at J@LC. Though Gibson’s compositions make up the bulk of their music, this eclectic group’s repertoire also runs the gamut with arrangements of material from Wild Bill Davis to Eric Clapton.